I was in my studio this weekend, feeling inspired. So here are some new designz! I love this new copper cuff for the rustic daddy and the new locket design with a mama bird and her eggs in a nest. 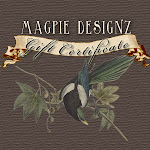 Visit magpiedesignz.com for more information about these new pieces!